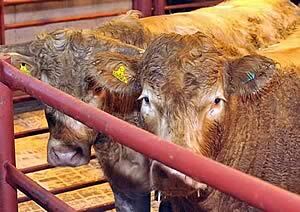 The Cumberland & Dumfriesshire Farmers Mart PLC had forward 51 prime cattle, 11 young bulls, 24 over thirty month cattle, 2,526 prime lambs, 1,638 prime hoggs and 4,987 cast ewes & rams at their weekly sale at Longtown on Thursday 4th July 2013. Another good show of prime cattle again met a fast trade and more required. Top price to 263.5p for a Limousin bullock shown by J.C. & D. Nicholson & Son, The Gill, Messrs Nicholsons run of cattle averaged 257.9p, others to 258.5p (twice) from A. & W.J. Taylor & Son. Limousin heifers sold to 259.5p from D.J. Garthwaite & Son, Wyseby Hill Cottage, their run of 5 heifers levelling at 254p. Limousin 263.5p The Gill, 258.5p (x2), 256.5p Dashwellgreen, 255.5p The Gill and Dashwellgreen, 252.5p, 251.5p (x2) Dashwellgreen, 250.5p Houghton House, 249.5p, 247.5p, 242.5p Dashwellgreen, 234.5p Houghton House. British Blue 255.5p The Gill. Charolais 247.5p, 243.5p (x2) High Stenries, 239.5p Dashwellgreen, 230.5p, 229.5p High Stenries. Limousin 259.5p, 256.5p, 254.5p, 253.5p, 245.5p Wyseby Hill Cottage, 242.5p, 224.5p Hallburn. British Blue £1,788 The Gill. Limousin £1,783 Dashwellgreen, £1,711 The Gill, £1,659, £1,633 Dashwellgreen, £1,628 Houghton House, £1,607 The Gill. Charolais £1,704, £1,608 High Stenries. Limousin £1,479, £1,295, £1,242, £1,239 Wyseby Hill Cottage, £1,236 Hallburn, £1,234, £1,201 Sceughdyke. Charolais £1,294, £1,287, £1,216 Sceughdyke. British Blue £1,226 Becton Hall. Limousin 242.5p, 229.5p Gardrum, 201.5p Harelawhole. Black & White 190.5p, 189.5p Whins, 170.5p Harelawhole. Black & White £1,364, £1,209 Whins. OTM cows saw some plainer sorts of offer with trade similar and topping at 228.5p and 185.5p for Limousin shown by Messrs Ritson, Swaites. British Blues to 163.5p from G.P. & E.A. Coates, Beckhall Farm. Limousin 228.5p, 185.5p Swaites, 149.5p, 147.5p High Stenries. Angus 142.5p, 141.5p, 138.5p Harehill. Simmental £1,172, £985 Morley Hill. Angus £1,083, £1,047, £1,024 Harehill. An excellent show of 2,526 prime lambs was forward to a full ring of buyers with some new customers operating. A quality show of best export Texel and Beltex lambs were forward and continued to sell at recent high rates, whilst the other Suffolk and Continental lambs were on par with the national average. Lightweight lambs continue to sell in excess of £70 and are probably best cashed whilst fleshed. The overall average was a respectable 221.2p per kilo. The demand for best export lambs was as good as seen for many weeks regularly selling between 240p and 270p and remain short of buyers requirements. 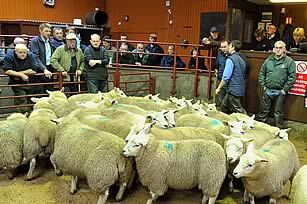 Top price of 272p per kilo for Texels from Messrs Hutton, How Farm with a top per head of £119.50 for Texels from A. Sutherland, Carran, Caithness. Texel £119.50 Carran, £109.50 Copperthorns, £109 Great Bidlake, £108.50 Carran. Suffolk £105.80 West Wharmley, £100 Sykehead and Haithwaite, £99.80 Long Strumble, £98.80 Kilnford Croft. Charollais £103.50 The Chestnuts, £100 West Wharmley, £99 Streethead, £96.80 Knowe Farm, £94 Trawill. Hampshire £90, £82.80 Chapel Farm, £76.80 Willimoteswick. Greyface £86.80 Great Bidlake, £85.80 Westend, £76.80 Riggshield. Hill Cheviot £80 Riggshield, £76.80 Kimmeter Green. Texel 272p How Farm, 268p Harene, 265p Carran, 261p Copperthorns, 257p Lustruther, 255p Carran, 252p Middle Farm. Beltex 242.5p Cowcorse Cottage, 238.1p, 222p Old Hall, 219p High Airyolland. Charollais 239p Golden Lane, 235p Trawill, 233p West Wharmley and Porterstown, 230p Cardew Hall. Suffolk 235p Nettling Flatt, 230p Carsegowan, 229p Woodhead, 227p Wallend, 226p Porterstown. Greyface 213p, 207p High Airyolland, 207p Great Bidlake, 203p Tarnside House, 201.9p Westend. Hampshire 220p, 218p Chapel Farm, 213p Willimoteswick. Half Bred 193p Nettling Flatt. The 696 light weight lambs sold to a top of £89.80 for Texels from Lustruther, £87.80 Croft Road and Tarnside House; Suffolk £78.80 Lustruther, £74.20 Albierigg; Beltex £73.80 Old Hall, £67.80 High Airyolland; Charollais £71.80 Keld Head and Golden Lane; Greyface £70.20, £62.20 High Airyolland; Half Bred £58 Nettling Flatt; Hill Cheviot £55.80 Cottage. Also marketed during the week on a weigh and pay basis were 260 lightweight lambs between 26 and 36 kilos, which are now sought after weekly. An unbelievable show of 1,638 prime hoggs was forward in the first week of July to a busy ring of buyers all still keen for hoggs providing they had good flesh. The sale average was 158.5p per kilo, similar to last week. Demand for hoggs is likely to continue, as long as they are carrying flesh. The sale was topped at £95.50 per head for Texels from Golden Lane and to 206p per kilo for Suffolks from Haithwaite. Texel £95.50 Golden Lane, £90.50 Marygate, £88.50 Horncastle, £87.50 Marygate. Charollais £92.50 Broomhills, £79.80 Marygate. Suffolk £87.50 Marygate, £85.50 Clackmae, £79.50 Marygate. Easycare £84.50 Mossfennan, £76.50 Marygate, £69.50 Mossfennan. North Country Cheviot £83.50 Horncastle, £80.50 Marygate, £76.50 Longoe. Greyface £82.50 Low Dubwath, £79.50 Horncastle, £77.50 Haithwaite. Hill Cheviot £74.50 Adderston Shiels, £72.50 Haithwaite, £67.50 Horncastle. Blackface £70.50 Marygate, £69.50, £68.50 Sornfallow, £67.50 Millriggs. Swaledale £69.50 Marygate, £67.50 Nunscleugh, £64.50 Westernhopeburn. Jacob £65.50, £59.50 Peth Head. Suffolk 206p Haithwaite, 191p Blackhaugh, 180p Marygate. Texel 201p Broomhills, 191p Palmer Hill, 190p Golden Lane and Lochend, 188p Broomhills. Hill Cheviot 193p Kidshielhaugh, 182p Blackhaugh, 181p Peth Head. Blackface 182p Millriggs, 180p Sornfallow, 175p Broomhills and Barker House, 174p Sornfallow. North Country Cheviot 180p Sornfallow, 176p, 174p The Mark. Easycare 178p Marygate, 169p Mossfennan. Swaledale 174p Marygate, 169p Nunscleugh, 168p Marygate. Greyface 168p Almagill, 166p Broomhills, 164p Cowcorse Cottage, 163p Westernhopeburn. A much larger show of 4,987 cast ewes and rams were forward to the usual ring of buyers with trade for all classes sharper on the week on the build up to the Muslim festival of Ramadam. Small ewes and rams of all classes continue to be short of buyers requirements. Heavy ewes to £122.50 for Texels from Cubby Hill, Riverside and Sawmill Lane, £120.50 Carran, £118.50 Riverside, £117.50 Haithwaite; Charollais £114.50 Riverside, £106.50 Baron, £104.50 Sawmill Lane, £102.50 Jonesboro; Suffolk £110.50 Jonesboro, £101.50 Riverside, £100 Catslackburn, 99.50 Jonesboro; Beltex £107.50 Waterside, £87.50 High Airyolland; Leicester £88.50 Lowes Fell, £86.50 Croft Road, £75.50 Sawmill Lane, £69.50 Gapshield; Zwartbles £82.50 Broynach, £72.50 Church Road, £71.50 West Clyth, £70.50 Broynach; North Country Cheviot £82.50 Sawmill Lane, £80.50 Longoe, £74.50 Kingside and Broynach, £71.50 Sornfallow; Greyface £76.50 Sawmill Lane, £75.50 Longyester, £74.50 Streethead, Sornfallow, Kirkhill, Aikengall, Pennant, Leithen Hall, Trecorner and High Airyolland. Hill ewes to £68.50 for Cheviots from Ysgubor and Longoe and for Blackface from Edges Green, other Cheviots £67.50 Ysgubor, £65.50 Bardnaclaven, £60.50 George Street, other Blackface £66.50 Gall Farm, £61.50 Longyester, £57.50 Mossfennan; Lleyn £62.50 The Mark, £60.50 No 1 Hallum, £56.50 Blackhaugh, £55.50 The Mark; Swaledale £62.50 Hesket House, £60.50 Coldshield, £55.50 Nettling Flatt, £48.50 Common House; Jacob £60.50 Woodside Cottage, £42.50 Ringliggate; Easycare £57.50 Mossfennan, £44.50 Cowcorse; Beulah £54.50 Cottage; Herdwick £52.50 Nettling Flatt. Rams to £130.50 for Texels from Netherplace, £122.50 Kirkland Green, £112.50 Glenhill; Suffolk £120.50 Aikton, £118.50 Great Bidlake, £108.50 Church Road; Charollais £120.50 Relief, £116.50 Sawmill Lane; Zwartbles £116.50 Holmlea; Leicester £114.50 Nunscleugh, £90.50 Gapshield, £73.50 Ysgubor; Beltex £112.50 Glenhill, £96.50 High Airyolland; Oxford £98.50 Severs; Dorset £96.50 Jonesboro; Lleyn £94.50 South Riccalton; North Country Cheviot £90.50 Baron, £72.50 Blackhaugh, £70.50 Kintradwell; Herdwick £74.50 Hesket House; Swaledale £66.50 Gall Farm, £58.50 Nettling Flatt; Blackface £60.50 Achingills.